Skinade: A Drinkable Skin Rejuvenation - Doctor Hermann M.D.,P.A. The cosmetic industry is filled with all kinds of anti-aging products that can make your skin look younger, from creams and lotions to supplements. Skinade is a unique liquid drinkable supplement manufactured and developed in the United Kingdom. The serum boosts the natural production of collagen in the skin and improves the density of fibroblasts, which are important cells that rebuild connective tissue. 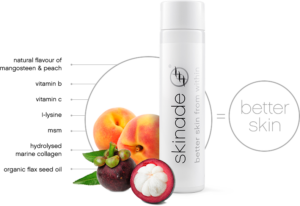 Skinade is made of essential micronutrients and fresh water fish that helps repair skin minimizing the signs of aging and contains mangosteen giving it a natural peach taste. Skinade is less than 35 calories and free from any artificial ingredients, harmful chemicals and toxins. As we age, we begin to lose collagen at the rate of 1.5% a year starting in our twenties. This loss of collagen leads to wrinkles, fine lines, dry and thin skin. Skinade operates from the inside out to restore depleted collagen and strengthen collagen bonds. Skinade is best used in conjunction with a skin care regimen and/or cosmetic treatment plan to gain the most benefit. Skinade works from within to trigger your own body to produce more collagen and hyaluronic acid. The advanced formula contains low molecular weight high grade collagen as well as essential micronutrients that ensure fast absorption and nourishment for your complexion. By drinking Skinade daily, your skin will look more radiant and it will be rejuvenated. Many health and beauty magazines like Natural Health, Aesthetic Medicine, Vogue, Beauty Report and others promote this cutting-edge product. Skinade is a revolutionary drinkable skincare. The 6 powerful active ingredients work inside the skin at the cellular level to maintain and support the skin. Hydrolysed Marine Collagen Peptides – a special ingredient that comes from fresh water fish that is low in sodium and mercury-free. About 7000 mg of hydrolysed marine collage peptides are included in each bottle of Skinade. MSM – a naturally occurring form of organic sulphur that is commonly found in all living organisms. The correct ratio of MSM in Skinade helps in the formation of collagen and keratin, enhances skin elasticity and inhibits cross-linking of collagen bonds, which is a major cause of skin aging. Vitamin B-complex – offers excellent nourishment for the skin, makes it radiant and glowing. Vitamin B Complex contains Riboflavin (Vitamin B2), Niacin (Vitamin B3) and biotin. Vitamin B2 helps in protecting skin cells from oxidative stress and Vitamin B12 with Folic acid play a significant role in the process of cell division. Omega 3 and Omega-6 – sourced from organic flax seed oil plays an important role in balancing dry and oily skin by keeping the skin moisturized and hydrated. These important and essential amino acids are the key to rebuild the collagen matrix at a cellular level leading to smoother youthful skin. Skinade is a powerful formulation engineered as a drink making it more bio-available to offer optimal efficacy at a high level compared to tablets or powder suspended preparations. Because Skinade is a liquid skincare formulation, a high proportion of active ingredients will be absorbed in the body with a rate of almost 95%, much higher absorption rate than any other digestible skincare product, which average a 30% absorption. These effective ingredients allow Skinade to work efficiently to increase skin thickness and in return reduce fine lines and wrinkles. After completing a course of Skinade, you will notice a great improvement in the suppleness and texture of your skin. Other benefits include healthier, stronger and faster growing hair and nails. Skinade is a multi-award winning anti-aging collagen drink that stimulates collagen helping you regain your youthful skin and you can notice improvements in your skin within as little as 30 days. Skinade is backed by research and consumers. According to clinical studies and consumers’ feedback, people between the ages of 20 and 30 have noticed improvement in the skin’s collagen by 7% and skin’s elasticity by 7.4% within just 30 days of starting Skinade. The results are more drastic and higher in older people as much as 6.7% increase in collagen density for people in their 40s. Hermann Wellness believes that Skinade is a wonderful product to compliment any cosmetic skin care regimen and treatment. If you want to improve your skin, you should attack it from the outside and now from the inside with Skinade available in our Tampa and St. Pete offices.